We will be developing this page to include the most Frequently Asked Questions and responses. If you have a question please ask it on our contact form. We will review them and update our FAQ list here. Please see, sign, and share our petition. Will the Sanctuary put a federal agency in charge of our coastal waters? Several federal agencies – including the National Marine Fisheries Service and the U.S. Coast Guard – are “in charge” of our waters in various capacities. Sanctuary policy and planning will follow the principles of public participation and adaptive management. 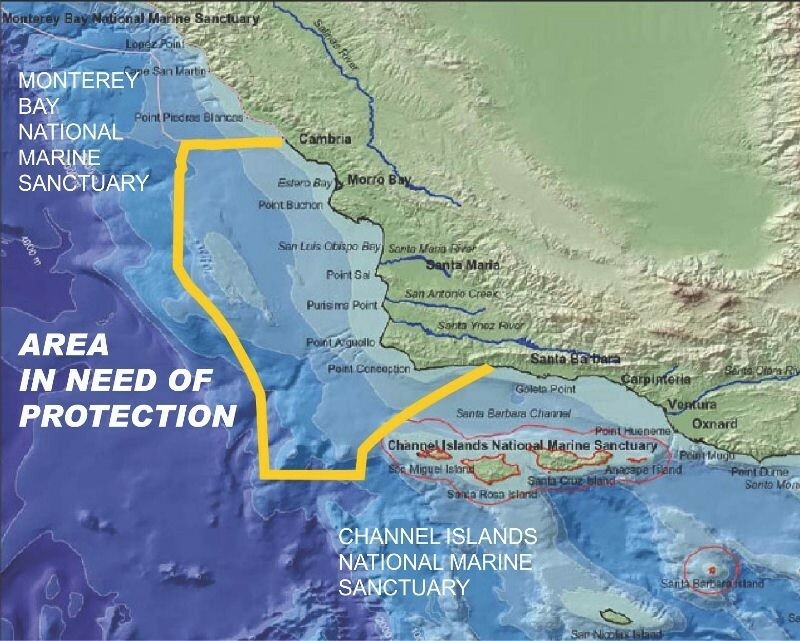 The Proposed Chumash Heritage National Marine Sanctuary will work with diverse local partners and stakeholders to promote responsible, sustainable ocean uses that ensure we maintain a healthy marine environment as the basis for thriving recreation, tourism and commercial activities that drive coastal economies. The Proposed Chumash Heritage National Marine Sanctuary will focus on protection of water quality and prohibit the disturbance of cultural resources and any future exploration, development, and production of oil and gas or seabed mining. Will the Sanctuary effect fishermen? The Proposed Chumash Heritage National Marine Sanctuary will protect fish habitat and water quality, ensuring a sustainable fishery. National marine sanctuaries do not regulate fishing, which is the purview of the National Marine Fisheries Service. NMFS works in partnership with Regional Fishery Management Councils to assess and predict the status of fish stocks, set catch limits, ensure compliance with fisheries regulations and reduce bycatch, both inside and outside marine sanctuaries. The Proposed Chumash Heritage National Marine Sanctuary will preserve the scenic beauty, biodiversity, historical connections and economic productivity of Central Coastal waters, conduct research and monitoring projects, offer volunteer opportunities, education and outreach events. Will the Sanctuary diminish our local voice? A Chumash Heritage National Marine Sanctuary will increase our local voice via a Sanctuary Advisory Council, a community-based body established by federal law to assure public participation in the management of the Sanctuary. The Advisory Council’s voting members will represent the Chumash, Agriculture, At-Large, Business/Industry, Commercial Fishing, Conservation, Diving, Education, Recreation, Recreational Fishing, Research and Tourism, plus local and state government jurisdictions. Advisory Council members lay the foundation for the Sanctuary’s structure, policies, and procedures. The Proposed Chumash Heritage National Marine Sanctuary’s goals to promote research, education, public stewardship and resource protection will be a major focus for the Advisory Council. The Advisory Council system has proven to be a powerful voice for the general public, responding to citizen concerns, ideas and needs. The Advisory Council provides a public forum for its constituents, working to enhance communications and provide a conduit for the concerns of user groups and stakeholders. Will the Sanctuary ban jet skis? Fred Collins tribal chair of the Northern Chumash Tribal Council and designee of the Proposed Chumash Heritage Nation Marine Sanctuary has been meeting and working with the surfer, jetski, and fishing communities as a whole and specifically working with surf and jetski community leader Van Curaza for over two years. The Chumash Heritage National Marine Sanctuary will do as the community wishes, adopting the policies informed by the local sanctuary advisory council, stakeholders and the public.